BREVARD COUNTY, Florida - The normal garbage collection schedule for household garbage, recycling, and containerized yard waste, will resume for unincorporated Brevard County on Tuesday, September 12, 2017. 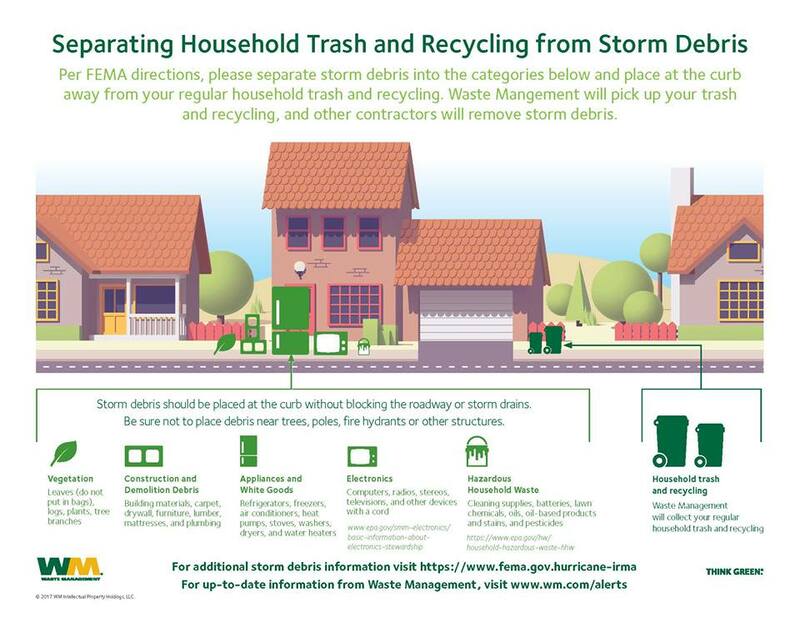 The County's disaster debris contractors will soon begin collection of loose piles of yard waste and construction debris from improved residential property. The actual routes and days of this collection do not follow a set schedule; however, all such debris set out in the right-of-way will be collected. Keep your yard waste and construction debris in separate piles at your curb. Cut up trees and branches to 4' foot lengths if possible. The County's Central Disposal Facility in Cocoa, the Sarno Road Landfill and Transfer Station in Melbourne, and Mockingbird Way Mulching Facility in Titusville, are open beginning at 7:30 to 5:30 today through Saturday if you choose to deliver your debris to a permitted disposal facility yourself. A decision is pending on whether to open the facilities on Sunday. White goods (refrigerators, freezers, washing machines, etc) will be picked up by Waste Management. Please call them to schedule special pickup. Do not put your yard waste on top of storm drains due to receding waters from Hurricane Irma flooding.